Today’s Game Master Toolbox Week Pick is from Azukail Games, one of several companies that publish lots of books intended specifically to make the GM’s life easier and their campaigns more interesting. 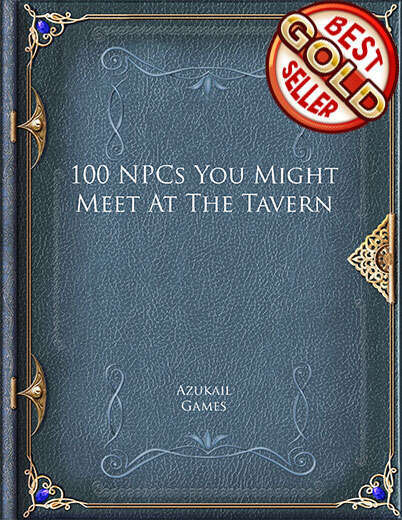 100 NPCs You Might Meet at the Tavern is exactly what it says – a set of one-hundred interesting and distinct people a hero might encounter, drink with, get information from, or wind up in a proper brawl with at a place of drink and revelry. There’s a lot of tavern-and-drinks related books from this outfit (they’re probably a lot fun to hang out with at cons), including 100 Fantasy Drinks, Fantasy Beer Names, and Grosk’s Tavern. Arian Nightsbridge: A big man with the crooked nose and sunken knuckles of a lifetime brawler, Arian claims to be a hedge squire. He can list every lord he’s fought for, and every master he’s served, though only those with a knowledge of the most obscure branches of noble family trees will recognize the names. Dressed in a roughspun tunic, he looks the furthest thing from a knight… except for the battle-tested sword at his side. Touchy about his word and his honour, what he lacks in courtly manners he more than makes up for in a willingness to stand and fight when it’s asked of him.